1 The Texting Disease: What is Forward Head Syndrome? 2 How Does Forward Head Syndrome Occur? 4 The Solution: One Key Exercise! 6 How Does the Back Stretch Work? The Texting Disease: What is Forward Head Syndrome? French version of the article by Atelier Qiétude. A few years ago I was sitting at the computer working on a book project, and my arm went numb. The numbness rapidly became a problem in the days that followed as I noticed I was getting low grade headaches, and had difficulty turning my head. It could have been a serious neurological problem, but in fact was simply due to sitting too much, with my head forward, staring at the computer, and not maintaining the normal amount of daily movement and exercise because I was so intensely involved in my writing. As I tried to figure out what was going on, I also noticed in the mirror that my head was tilted slightly forward. What helped cure my problem? The Back Stretch Exercise, which gets results in only 10 minutes a day. Forward Head Posture (FHP) is a term used to describe a posture in which the cervical spine is positioned forward, and the head moves forward relative to the shoulders. Forward Head Posture, or Forward Head Syndrome (FHS), can cause a host of symptoms often attributed to neurological disorders, allergic asthma, disc and joint degeneration, and vascular problems. Trauma – falls; whiplash; etc. How Does Forward Head Syndrome Occur? Exercising incorrectly can also contribute to Forward Head Syndrome: military presses and squats with the bar behind your neck, or jogging with the upper body hunched forward, are both contributors. On my way to teach class at 6:30am one morning I saw several people running with forty-pound kettlebells behind their necks! Forward Head Syndrome can be compounded by weak back muscles, an inflexible spine and tight hips. The correct posture for the head is when the center of the hole in your ear (external auditory meatus) is in line with the tip of your shoulder (the tip of the acromian process). If your ear is forward of that line, your head is forward of its normal alignment. Having one’s head in a forward posture can add up to thirty pounds of abnormal leverage on the cervical spine. For every inch your head moves forward, it gains 10 pounds in weight, as far as the muscles in your upper back and neck are concerned, because they have to work that much harder to keep the head (chin) from dropping onto your chest. It pulls the entire spine out of alignment. Pressure may be created on the sub-occipital nerves, causing headaches. Thoracic vertebrae are subjected to compressive forces which can lead to the creation of hyper-kyphosis (“Dowager’s Hump”). Hyper-kyphotic posture affect lung capacity, and interferes with heart function. Forward Head Posture may result in the loss of 30% of vital lung capacity. The vertebrae in the neck can become wedged forward, creating pressure on the discs. The vertebral artery in the neck can become compressed, causing reduced blood flow to the brain. This is exacerbated by the constant contraction of the sub-occipital muscles which help raise the chin. There may be tingling and numbness in the arms, or even reduced blood flow to the arms and hands. We have seen many patients in the clinic who had what appeared to be neurological degeneration symptoms that were, in fact, a result of nerve and blood vessel compression in the neck. Returning the head to its correct position, and the upper back and thoracic area to an open and free moving state, resolved the symptoms. The Solution: One Key Exercise! There are many ways one can help cure Forward Head Syndrome: changing your habits; receiving physical therapy, massage and acupuncture; sitting less and using your cell phone and computer less; strengthening your back muscles, and exercising intelligently. AND….. there is One Key Exercise that can restore the position of your head and spine to their normal healthy alignment, and can relieve many or all of the symptoms of Forward Head Syndrome. That one exercise is The Back Stretch. The Back Stretch, performed in only 10 minutes, twice a day, helps put your head back in its natural position. It is simple and relaxing. The beauty of this exercise is that you can do it lying down! The Back Stretch should be done on a thin rug or exercise mat, such as a yoga mat. It should not be done on a bed or soft cushiony surface. Lie on the floor, with the feet flat on the floor and the knees bent. 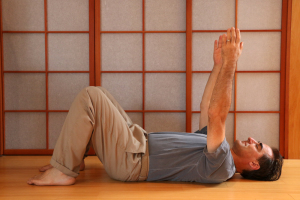 Gently tilt your pelvis so the low back is flat on the floor. Draw the chin in slightly to lengthen and straighten the neck. By tilting the pelvis and drawing in the chin, you should feel a faint traction on the whole spine. Raise the arms up so that they are perpendicular to the floor. Make sure you reach up enough so that the shoulder blades come off the floor. Keep reaching forward as you let the arms cross. The harms hang. Do not hug yourself. Rest this way for 10 -15 minutes. Ideally do The Back Stretch twice a day. If the position is initially uncomfortable for your neck and upper back, you can elevate the head with a few magazines or slim books. As the posture of your neck and upper back improve, you can gradually remove the magazines or books. When you have finished lying in The Back Stretch for 10-15 minutes, roll on your side and get up slowly. Walk around for a few minutes to let the muscles relax, and let the body accommodate to the new information you are giving it. How Does the Back Stretch Work? 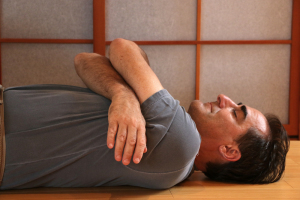 Lying on the floor in this position gently opens the inter-vertebral spaces, taking pressure off the discs. Lifting your shoulder blades off the floor means you are lying on your ribs, which allows the back muscles to engage in such a way that the head is drawn back towards its optimal position. The shoulder blade position, in conjunction with the arm position, also allows the ribs to fall into their natural alignment. Having the arms crossed gently rounds the back and softens the chest, while relaxing the trapezius muscles. The crossed arm position also slackens the chest muscles which pull the shoulders and neck forward, and fixes the scapula if they are too tight. The crossed arm position eliminates any restrictions that might interfere with normal scapular movement. Freeing the scapula further aids the neck in returning to its correct position, because the shoulder assembly largely hangs off the neck, and any imbalance in muscle tension relating to the shoulder assembly will affect the neck alignment. The entire set of alignments used in the Back Stretch Exercise returns the shoulder girdle and neck to their normal positions.